a fairly sizable asteroid has been spotted on a trajectory that gives it a fairly decent chance (about 1 in 4,000) of striking the Earth. That is actually better odds than the chance you will get killed in a traffic accident any time you get in a car (1 in 6,700). At one point the odds were actually being calculated at 1 in 300. So this particular object has raised a few eyebrows, to put it mildly. Enough that some people think it would be time to call the drilling crew together. Or something. The asteroid in question, known as 1950 DA, will pass quite close to the Earth in a little under 900 years. The asteroid is apparently made up of rubble and somehow is still managing to hold itself together, despite gravity, at a speed of about 9 miles per second. The object is not that dense, so not an iron or stone asteroid at least, probably ice and debris. So because I have a ridiculous sense of curiosity, I decided to plug some of this data into a tool called Impact: Earth! on the Perdue University website. This online tool allows you to calculate the broad effects of an impact event, factoring in things like speed, size, density, and whether the object comes down on land or in water. I have used this tool many times over the years to try to see what sort of object could create some of the impact craters scattered around the globe. So assuming a few details such as an entry angle of 45 degrees and having the object come down offshore in 100 feet of water, here is what would happen to you if you were, say, 50 miles away standing on a beach. So, the equivalent of someone standing on a beach on Deer Island, looking out towards Stellwagen Bank. The object would begin to break up in the upper atmosphere, somewhere around 204,000 feet, way up in the mesosphere (the part of the atmosphere above the stratosphere). When the object (now in pieces) strikes the ocean, it is still traveling about 5 1/2 miles per second. The amount of energy released by the impact is 3.18 x10^19 joules, or the equivalent of 7.6 x10^3 Megatons of TNT. 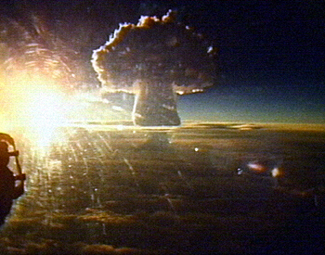 In other words, the explosion is about 1,500 times as powerful as the largest nuclear weapon ever detonated. That weapon looked like this from 100 miles away. Pretty big from 100 miles away. And so imagine something several orders of magnitude larger than that. And you are only half that distance away. There is actually no fireball to speak of, because little of the object is vaporized. Sixteen seconds after impact, the seismic wave would hit, approximating an earthquake of 7.2 on the Richter scale. But some 130 to 140 seconds later, debris begins to rain down all around you. Some of it is the size of hail, some of it is 3 or 4 inches across, and occasionally there are even larger pieces. The truly scary stuff starts about 4 minutes later. That’s when the shock wave arrives. The force of the over-pressure (about 5.4 pounds per square inch) is the equivalent of hurricane force winds blowing around 175 miles an hour. It instantly blows down virtually all trees, strips all the leaves from the few that stay up, breaks all windows, smashes most prefab and wooden-framed buildings, knocks everyone still standing off their feet, rolls some cars and trucks over, and probably deafens you. Sometime between 75 and 80 minutes after impact, the tsunami arrives. It is between 2 and 4 meters high, or between about 7 and 13 feet. The impact that ended the Cretaceous era and sealed the fate of the dinosaurs was actually much, much worse, if you can imagine. But still, this would be bad, especially if you were anywhere close to it. Not the end of civilization, but if it came down on land somewhere, that country (or countries) would have a natural disaster on their hands that would dwarf most other disasters. Plus a crater about 6 miles across and 1,500 feet deep.